Arians coached Leftwich in 2010-11 on the Pittsburgh Steelers. GLENDALE, Ariz. - When former Cardinals head coach Bruce Arians hired Byron Leftwich to join his staff as a coaching intern in 2016 to assist with quarterbacks, Arians had wanted Leftwich to get into coaching for years already. Leftwich was the 7th overall pick in the 2003 NFL draft and went on to play quarterback for the Jacksonville Jaguars, Atlanta Falcons, Tampa Bay Buccaneers and Pittsburgh Steelers. His last stint in his playing career was in a backup role for the Steelers from 2010-2012. Arians was the Pittsburgh offensive coordinator from 2007-2011. "When he played quarterback for me, he was so smart," Arians told 12 Sports' Cameron Cox Saturday during a phone call. "He did a great job of helping out young quarterbacks in Pittsburgh and he mentored them and I was kind of after him for a few years to get into coaching." Arians said once Leftwich started coaching, he fell in love with it. In just one year, Arians promoted Leftwich to quarterbacks coach and had Leftwich call plays during 2017 preseason games. Fast forward to today, Leftwich has been promoted to Cardinals offensive coordinator, under first-year head coach Steve Wilks. The Cardinals (1-6) fired first-year offensive coordinator Mike McCoy on Friday after a 45-10 loss to the Denver Broncos at home on Thursday night. Fans had been clamoring for McCoy's job for weeks as the Arizona offense, which could be associated with words such as stagnant, flat, incapable, failed to produce week to week. The main concern was that star players David Johnson and Larry Fitzgerald were not being used to their abilities. "I felt bad for Mike because he's a heck of coach," Arians said. "Obviously his struggles are well-documented and I think the move to Byron is a good one." Arians said he hasn't been able to watch the team play much as he is traveling a lot while calling games for CBS, but said he was admittedly shocked at the underperforming Cardinals. "I know the talent there and to see them struggle that much was amazing to me," he said. "I never guessed in my wildest dreams they'd be 1-6." Even though McCoy is out and Leftwich is in, Arians said fans should not expect things to change like the wave of a magic wand. There are big problems on this team and specifically up front. "I hope people don't put too much on (Leftwich)," Arians said. "With that offensive line, with the position it's in with injuries, it's going to be tough." However, Arians did say that Leftwich and wide receivers coach Kevin Garver, who will assist in playcalling, were both on his staff and have some knowledge in strategy that McCoy maybe lacked. "I think (the team) will get better," he said. "I think (Leftwich and Garver) know how to use David Johnson better." But, it's not like the playbook can just be reverted back to 2016 or 2017's just like that. The Cardinals have a young, rookie quarterback that has already molded his brain to one playbook in his young NFL career. Arians said it would take some time for big adjustments. But, he has nothing but positive things to say about Josh Rosen. "I thought he was the most professional-ready quarterback in the draft," Arians said. "I think he's going to be a heck of a player. He fits that style of offense that we ran and I just hope the offensive line can stay healthy enough to protect him." 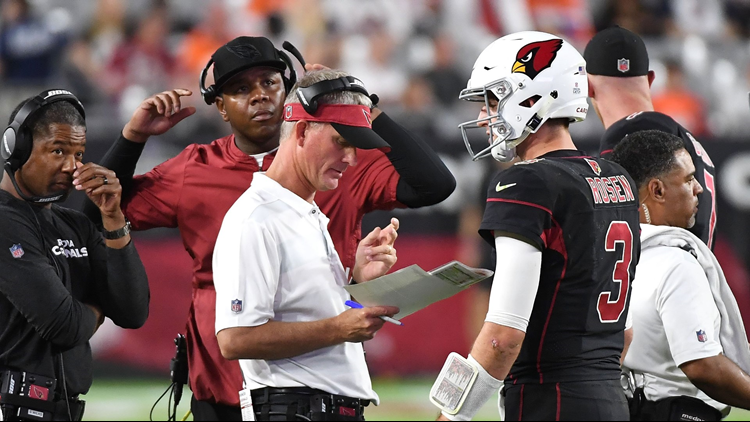 When Leftwich, who Arians saw had coaching potential nearly a decade ago, got the promotion to offensive coordinator, he was quick to congratulate him. When asked if he gave Leftwich any advice, Arians, who coached the Cardinals for the past five seasons, said no. "He doesn't need any advice," he said. "It's just a matter of him doing what he believes in and tuning out the noise. Now he's the guy, between him and Kevin Garver, but they know how to move the football." The Cardinals first game with Leftwich calling the plays comes next Sunday, at home, against a 49ers team the Cardinals already beat once this season.